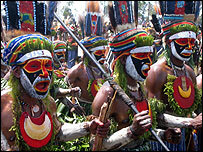 In Papua New Guinea tribes gather peacefully to celebrate their ancestral traditions with singing and dancing. Mock battles are also staged but, as Nick Squires reports, in real life there has been a bloody resurgence in tribal fighting. It is one of the most extraordinary sights I have ever witnessed. Beneath an intense tropical sun and surrounded by jungle-clad mountains, 2,000 tribesmen and women paraded onto a sports field. Their bodies glistened with pig fat and their faces with red, black and yellow ochre. The men wore pig tusks through their noses and quills from the cassowary, a giant bird the size of an emu. They sported glittering head-dresses made from bird of paradise feathers, and round their waists they wore grass kilts, known somewhat cheekily in Papua New Guinea's Pidgin English as "arse-grass". This was the Mount Hagen Show, one of several tribal gatherings held annually in the rugged highlands of Papua New Guinea. It is one of the most impressive anthropological displays on the planet. The men stamped their feet and marched in column, beating drums and singing blood-curdling war songs. Mock fights involving warriors armed with spears, shields and stone axes thrilled the small crowd of tourists watching from the sidelines. 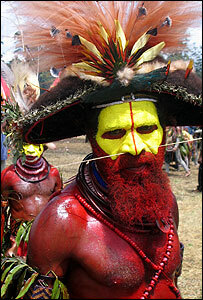 These days though, there are real-life battles going on in the highlands of Papua New Guinea. Instead of bows and arrows, tribes are using automatic weapons. Bamboo breast-plates and swaying head-dresses have been replaced by flak jackets and helmets. The highland tribes have always fought over land but the country's increasing population has intensified age-old feuds. The problem has also been made worse by political intrigue. Much of the gun violence stems from the country's last national election, three years ago, when politicians armed their clansmen with firearms in order to intimidate rival tribes. More than 30 people lost their lives. Friendly and welcoming towards outsiders, the people of Papua New Guinea are often quick to anger when it comes to disputes among themselves. The violence is fuelled by a deeply-ingrained tradition of payback. Allegiance to wantok - literally "one talk" - the Pidgin word for a person's language group or tribe is paramount. With the help of a local journalist, I arranged to meet some of these modern-day tribal fighters. Our rendezvous was in the bush, not far from Mount Hagen. Matthew Gispa is on the run from the police. Last year, in a tribal fight over land, the 28-year-old killed a man from an opposing clan. He shot him dead with an M16 assault rifle, one of three firearms his village had bought at great expense from a gun dealer. He showed little remorse. "My enemy had a gun too, so if I hadn't shot him, he would have shot me," Matthew told me, a razor-sharp machete in his hand. He now fears a revenge attack. "They'll come back and they'll try to kill me," he said. Tribes are taking up arms because they have lost all confidence in the police, the courts and local government to fairly mediate their disputes. In many parts of Papua New Guinea, the police are unable, or unwilling, to intervene. "We don't even have enough diesel to go out on patrol," a police sergeant said, gnawing on a stick of raw sugar cane. "We're outgunned by the tribal fighters. Many times we just have to let them get on with it." A recently released report found that many of the weapons being used are bought or stolen from the police and the army. M16s and Australian-made self loading rifles are the weapons of choice. Local mercenaries, many of them ex-soldiers or police officers, hire themselves out to warring tribes. They are paid in money and women and Papua New Guinea's most highly-prized commodity - pigs. It is hard to establish the number of people being killed because local officials believe more than 90% of deaths go unreported. One well documented fight, which lasted for several months in 2002, resulted in the deaths of 120 people. Much of the fighting goes on in remote valleys. There are no roads, and police stations, hospitals and government offices have been abandoned. Infrastructure in the highlands, as several people told me, is "ol bagarap" - another colourful Pidgin expression meaning broken down - literally, "buggered up". Gatherings such as the Mount Hagen show were introduced by Australian colonial authorities in the 1950s and 60s as a way of promoting peace between the tribes. While the painted and plumed tribesmen get on perfectly well during the festivities, when they return to their villages it is often a different matter. I watched the last day of the show with a British anthropologist who has spent 15 years in Papua New Guinea. When he first arrived in the country, a few tribes were starting to use home-made shotguns. "But the other day I heard the sound of rocket-propelled grenades," he said. "It's become an arms race." It is a spiralling cycle of violence which is threatening the very fabric of life in this most beautiful, but deadly, part of Papua New Guinea. From Our Own Correspondent was broadcast on Thursday, 25 August, 2005 at 1100 BST on BBC Radio 4. Please check the programme schedules for World Service transmission times.